Heatherwick Studio were commissioned to design a new 120m tall, boutique hotel tower in Sheung Wan. The design had to be distinctive enough to stand out from the surrounding buildings and to differentiate itself from the increasing number of small hotels entering the market. In an attempt to overcome Hong Kong’s restrictive planning regulations and realise something markedly different, the stepping boxes of the facade disguise floors and bay windows and form a texture on a macro scale across the facade. The brief called for a mid-range hotel product providing 200 rooms, a restaurant, bar, health club and swimming pool. The concept remains evident on the inside of the facade, its stacked boxes pushing in and out, forming furniture and animating light. 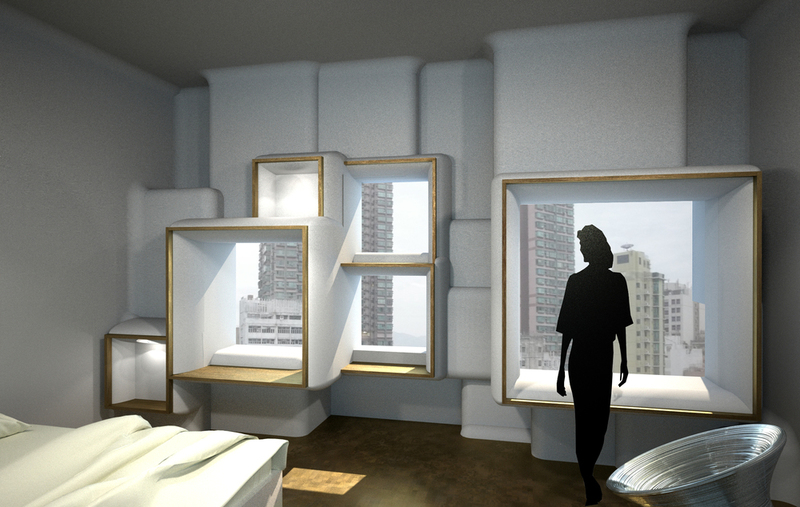 Alex Jones was Project Architect on the hotel project whilst leading the Heatherwick Hong Kong Studio. Alex worked closely with the local consultants to eventually win Building Department approval for this challenging design.